Rust Repair Panels – Dog legs, wheel arches, cab corners, etc. Taking the next step in your maintenance or restoration project means relying on Raybuck Auto Body Parts. We are one of America’s leading suppliers of restoration and replacement auto body products and will assist you with determining exactly what you need. However, it’s a good idea to understand our extensive selection of body panel options by referring to our truck and car diagrams for extra detail. Bumpers are located at the very front of the vehicle, below the front grille. They’re intended to be the first thing to hit an object in front of them (such as another vehicle) and to minimize the impact and damage to the rest of the vehicle, minimizing repair costs. As a result, they often need to be replaced after a front-end collision. Bumper ends are an important addition to the bumper itself. They’re situated at both ends of your front and rear bumper. They seal the larger assembly from the corrosive influence of dirt, water and road debris — all factors that can cause damage over time to these parts. Also called a bumper valance, these can be found on the front, rear or both on most modern trucks. Valance panels attach to the underside of the bumpers and resemble streamlined plastic “flaps.” This component serves first to help direct airflow in the pursuit of aerodynamics and second to conceal and protect underside components. Also called inner fender wells, inner fenders can take a beating from the environment and daily driving conditions. They are the portion of the vehicle’s body that sits between the engine and the wheels. They provide protection against outside conditions plus rocks and other types of debris thrown by wheels. Fenders typically form an arch — made either of plastic or metal — on the side of the vehicle body, around each of the wheel cutouts. Rotating tires can throw lots of water, snow or pieces of debris while driving, so fenders help mitigate some of this matter. The cowl panels sit beneath the lower windshield trim of your car or truck, above the firewall and right at the pivot point for your vehicle’s hood. They typically provide “storage” for windshield wipers when they are not in motion and prevent flying debris and excess moisture from entering the vent panel. The complete truck door is made of several components, but this term refers to the largest panel and shell. A vehicle’s door panel provides attachment points for handles and often side-view mirrors as well. Areas at the bottom of doors can trap water, dirt and debris — especially when drain holes get clogged. Lower door skins tend to experience rust and corrosion — that’s part of their job. Instead of subjecting the entire vehicle’s door panel to harsh treatment from kicks, scuffs, bumps and flying debris, lower door skins offer a replaceable option when just the lower portion of the door has experienced damage, rust or wear-and-tear. Your vehicle’s rocker panels are located between the front and rear tires, along the floor and beneath the vehicle’s doors. Rocker panels are typically made from steel. They provide structural support and continuity between the front and rear. These parts tend to see especially rough treatment on work trucks and among off-road enthusiasts. Cab corners on a truck refer to the section of the body at the rear of the cab, between the passenger section and the bed. These steel panels are another environment-facing component that tends to experience damage and corrosion over time. Your truck’s lower front bedside is an area that receives a lot of kickback from stones, gravel and salt, thanks to its being situated between the cab and the rear wheels. Because of the location, this panel often rusts over time and will need to be replaced. Your truck’s rear panel is the piece of the body at the rear of the cab, above and overlooking the cab. Rear panels may experience rusting and corrosion, however damage from objects seated loosely in the bed of the truck is even more common. Wheel arch panels receive abuse from grime and salt. These are the panels that sit above and around the truck wheels. They protect the rest of the body from moisture and debris thrown by your tires, so they often need to be replaced after years of use. Manufacturers tend to put foam in between the wheel arch and the inner wheelhouse, to help limit vibration and noise, but this foam holds moisture and causes both panels to rust. A truck’s wheelhouse is the portion of the body at the rear of the truck, above the rear tires. The outer wheelhouse faces the tires, and the inner wheelhouse faces the interior of the bed. Both undergo their share of potential damage and wear-and-tear from use and the elements. This area is the one located between the rear wheel and the rear bumper of your truck. They commonly get scratched, dented and dinged from parking lot bumps or if you accidently back into another vehicle or object. Road grime, salt, and mud often get stuck on the inside of this panel which causes it to rust from the inside as well. Header panels are an important part of the body that provides support and mounting locations for grille assemblies and headlights. Keep an eye on this panel – both the visible and covered parts – for rust and other signs of wear. This component is another one of the most visible and functional parts of your vehicle’s body. 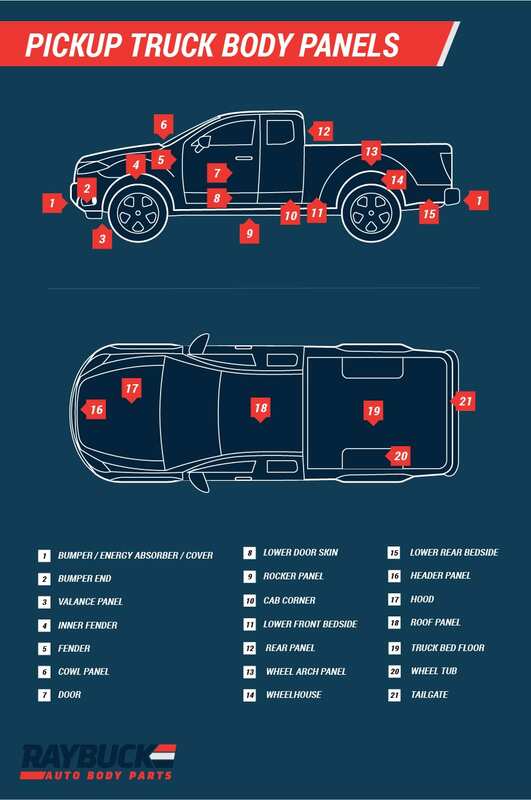 The hood protects your engine and other essential components of your truck. Whether you have a rusted or damaged hood, replacing it is often relatively easy. The roof panel covers the cab of your truck, and you likely don’t give it much thought most days. Because it is often out of site, you may not notice rust or other damage to this panel. Even direct sunlight over prolonged periods can damage your roof panel. Your truck bed floor takes a beating – from payloads going in and out, to salt, water and debris that accumulates in it. Your floor is likely made up of several different panels. Depending on the damage you may be able to only replace parts of it or certain panels or supports. Like the rest of your truck’s bed, the wheel tub is subjected to the elements, plus impacts over time due to heavy use. Wheel tubs are the rounded sections above the rear tires that extend into the bed area. Located at the very back of your truck, there is no end to the ways you can damage a tailgate. Whether you back into a post in a parking lot or get rear-ended while sitting in traffic, tailgates are a commonly damaged component of your vehicle. These will also rust out over time along the lower edge. Bumpers are located at the very front and rear of the car. They’re intended to be the first thing to hit an object in front of them and to minimize the impact and damage to the rest of the vehicle, minimizing repair costs, which often means they need to be replaced after a front-end collision. Bumper ends are an important addition to the bumper itself. They’re situated at both ends of your front and rear bumper and seal the larger assembly from the corrosive influence of dirt, water and road debris — all factors that can cause damage over time to parts made from steel and other metals. These can be found on the front, rear or both on most modern cars. Valance panels attach to the underside of the bumpers and resemble streamlined plastic “flaps.” This component serves first to help direct airflow in the pursuit of aerodynamics and second to conceal and protect underside components. Also called inner fender wells, inner fenders can take a beating from the environment and daily driving conditions. They’re the portion of the car’s body that sits between the engine and the wheels. They provide protection from outside conditions as well as rocks and other types of debris thrown by the wheels. Fenders are some of the most recognizable car components. They form an arch — made either of plastic or metal — on the side of the vehicle body, around each of the wheel cutouts. Tires can throw lots of water, snow or pieces of debris while driving, so fenders help mitigate some of this. The cowl panels sit beneath the lower windshield trim of your car, above the firewall and right at the pivot point for your vehicle’s hood. They typically provide a place for windshield wipers when not in motion and prevent flying debris and excess moisture from entering the cowl and vent panel. The overall car door is made of several components, but this term refers to the largest outer panel and shell. Your car’s door panel provides attachment points for handles and, more often than not, side-view mirrors. Areas at the bottom of doors can trap water, dirt and debris. Lower door skins often suffer from rust and corrosion. Instead of subjecting the entire car’s door panel to harsh treatment from kicks, scuffs, bumps and flying debris, lower door skins take the worst of the damage and can be replaced when necessary. Your car’s rocker panels are located between the front and rear tires, along the floor and beneath the doors. Rocker panels are made from steel. They provide structural support and continuity between the front and rear, as well as protecting the frame of your car from exposure to moisture and dirt. The dogleg is a part of the car’s quarter panel that connects into the rocker panel. It’s located right behind the rear door and in front of the rear wheel opening. This part of the body is a hotspot for damage from road debris as well as rust. Wheel arch panels receive abuse from moisture, grime and salt. These are the panels that sit above and around the wheel arches so they are often covered in water, salt and other dirt thrown up from the road by your car’s wheels and other passing vehicles. The wheelhouse is the portion of the body located above your car’s tires. These components can experience their share of potential damage and wear-and-tear from use and the elements. The quarter panel on your car is located between the rear door and the trunk. These panels are often damaged in parking lot fender benders or rear-end traffic accidents. For some vehicles you can purchase just the lower rear quarter panel section so that you do not have to replace the entire quarter panel. Lower rear quarter panels usually go from a trim line in the body down and extend from the wheel opening back to the bumper. Fender extension panels improve the functionality and aesthetic appeal of the fender itself. They’re typically located between the bumper and the fender and provide additional impact resistance. Header panels are located above your bumper and offer a place for your headlights and grille to attach. They might be made from sheet metal, fiberglass or even plastic depending on the car’s year, make and model. 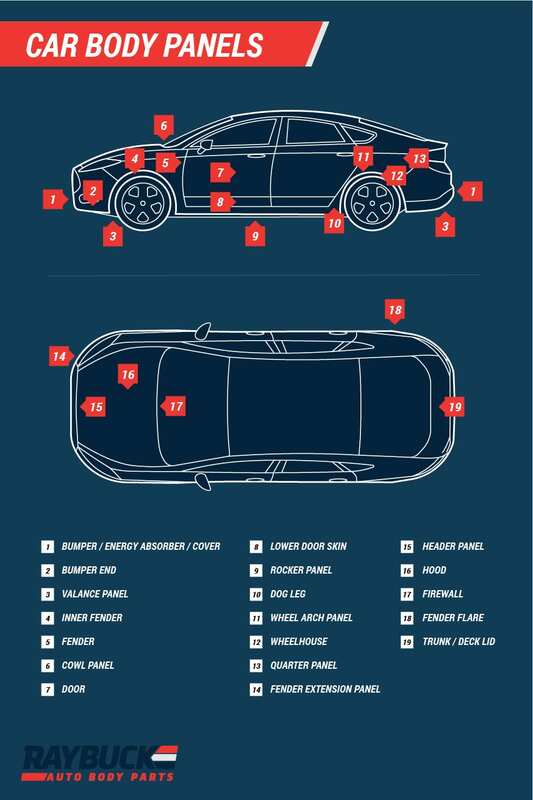 Your car’s hood is another one of its most visible and functional components. Driving a vehicle with a compromised hood can introduce debris and other hazards to your engine, possibly causing far worse damage than the rust you were putting off fixing. The firewall is a hugely important piece of every car that separates the frame and engine from the passenger compartment. In the event of a collision, the firewall protects drivers and passengers from the bulk that is the vehicle’s engine compartment. A fender flare on a car is an extension of the fender that provides extra coverage for extended or oversized wheels. It’s important because of the amount of snow, rain and debris spinning wheels can kick up. Fender flares help protect the rest of your car from this flying debris. The truck or deck lid of your car is a cover that gives you access to your storage area. It’s affixed with hinges and may be opened manually with a push-button or key fob. Truck lids are often damaged in rear end collisions. When you shop with Raybuck Auto Body Parts, you will receive top-quality panels, superior customer service and a knowledgeable team to assist you in finding the right truck or car panel. Each panel is made for your vehicle’s specific make, model and year of vehicle using advanced technology to ensure a perfect fit. Raybuck’s expert sales representatives will determine which high-value auto body panels and parts fit your needs. We offer competitive pricing and meet premium standards for quality and durability. Check out our full inventory of auto body parts and panels here. Copyright © 2019 Raybuck Auto Body Parts. All Rights Reserved.